AO staff are Leave No Trace Master Educator certified and American Canoe Association (ACA) Level I and II River Kayak Instructor certified. As our paddling and backpacking community grows, we're excited to offer courses and workshops to pass along what we've learned over the years. Our paddling courses are small, with one instructor for every four participants. Below you'll find our new courses and workshops for 2018! Our waterways are always changing. This workshop will focus on what makes up our local creeks and river, how water reacts to those things, and how to decipher and recognize the safest path. Utilizing our "river in a bag", we'll have a hands-on discussion covering how water reacts to river features (downstream and upstream V, eddy, eddy lines, hydraulics, holes, seams and standing waves, etc); and hazards - both natural (sweepers, deadheads, strainers), and man-made (bridges, low-head dams, dredged areas). We'll focus on how these affect the paddling experience and how they change at different water levels. I've never been but I'm eager to get out there! I've been paddling a few years. I basically live no the river! The SmartStart Paddling Orientation will expose participants to basic kayak safety and paddling skills, covering the paddling environment, personal preparation, getting in and out of your boat, and basic strokes and maneuvers. This course is great for brand new paddlers that have not spent a lot of time in a kayak. Class size limited to three participants. If so, what is the make and model of your kayak? Once you submit this form we will email a link to another form with more detail. Please feel free to include any questions you may have here. Thank you! We'll be in contact to get more info shortly. The Introduction to Kayaking course is designed as a program emphasizing safety, enjoyment and skill acquisition for entry level kayakers. We'll cover personal equipment (types of kayak, paddle and PFD), effectively using a throw rope, kayak carries, loading and unloading from vehicles, basic terminology, land and water etiquette, launching/landing from land and dock, controlled capsize/wet exit, and emptying a kayak. Maneuvers include spin, abeam, forward and stopping. Strokes include forward, back, draw, sculling draw, sweep, reverse sweep, rudder and low brace. Thank you! We'll be in contact shortly with more information. 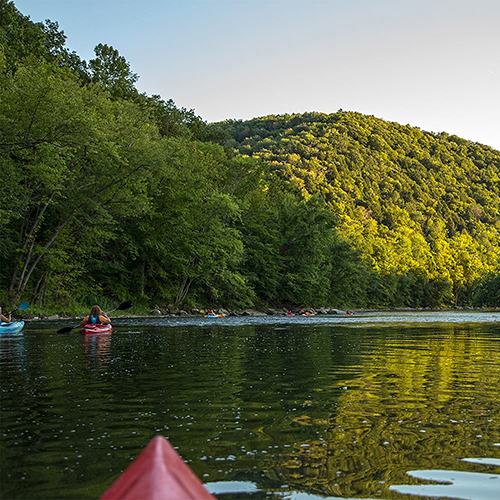 Our Intro to River Kayaking course will focus on understanding the features of a river (downstream and upstream V, eddy, eddy lines, hydraulics, holes, seams and standing waves, etc) to better "read the river" while paddling. 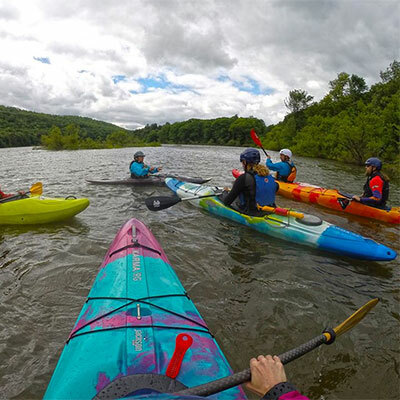 Participants will leave with a better understanding of US Army Corps of Engineers outflow from Kinzua Dam, monitoring those levels, and how they affect the paddling experience. Participants will also fine-tune strokes and maneuvers learned in the Intro to Kayaking course.